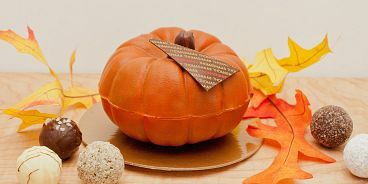 As long days fade and the weather begins to cool, stay warm with a burst of fall-themed flavours like pumpkin, cinnamon and ginger available now through November 15 at Thomas Haas Chocolates & Pâtisserie.From pastry creations such as Pumpkin Pie with cinnamon Chantilly cream and caramelized apples, to hot drinks like Pumpkin Hot Chocolate with house-made roasted pumpkin milk and a spiced marshmallow, to delectable Pumpkin Macarons, Truffles and Lollipops, Thomas Haas expertly captures the essence of autumn with an array of sweet, savoury and spiced offerings guaranteed to tempt the palate and warm the heart. Fall menu offerings are exclusively available at Thomas Haas’ two cafes in North Vancouver and Kitsilano now through November 15. A selection of year-round favourites are also available for purchase and shipping across North America in theonline shop. About Thomas Haas Chocolates & Pâtisserie Offering exquisite pastries and gourmet sandwiches, cakes and confections, award-winning specialty coffees and his iconic line of handcrafted chocolates, Thomas Haas Chocolates & Pâtisserie is the namesake creation of internationally acclaimed, fourth-generation pâtissier Thomas Haas. Vancouver magazine’s prevailing Pastry Chef of the Year, Haas carefully selects and sources only the finest, high-quality ingredients to adorn and accent his hand-spun creations, including B.C. wine, oak barrel-aged Quebec maple syrup, Tahitian vanilla beans, Fraser Valley hazelnuts, fresh Okanagan fruit and top-shelf European liqueurs. Thomas Haas products are exclusively available at their two unique destinations in North Vancouver and Kitsilano and at select high-end retailers and cafés across North America.